Interview by Lori Bizzoco. Written by Courtney Shapiro. 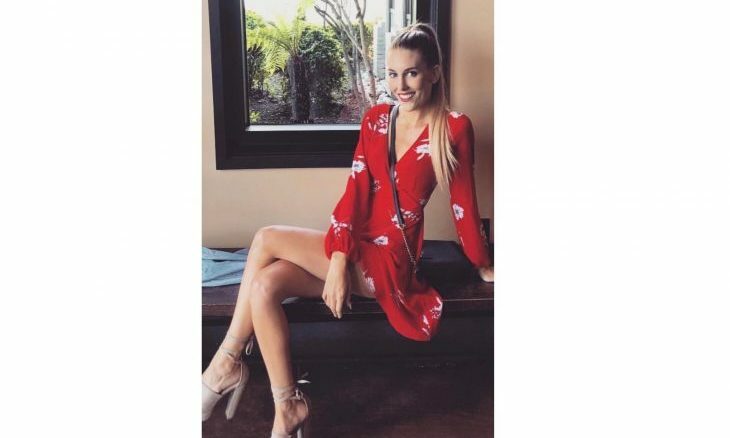 Kaci Campbell flew out to Hawaii with Evan Smith, her long-term, live-in boyfriend to join the cast of the exhilarating reality show, Temptation Island. The couple had been struggling with their relationship and not sure whether they should end it or move on. As we saw on tonight’s finale, Evan called it quits with Kaci leaving her for his new girlfriend, Morgan Lalor. We just spoke to Kaci and she says she is the happiest she’s ever been in her life. In our exclusive celebrity interview we chat with Kaci about her and Evan’s promise to one another and game plan, her connection with Val Osipov, and what life looks like now that she is off the island. 1. You sound like you’re in a great mood. Can you tell us why? I’m not going to lie. I’m totally nervous for the finale. I haven’t seen it, I’ve heard about it from a lot of different reporters and through Reality Steve’s podcast; he’s told me all about it. I’ve heard it’s very brutal and hard to watch, and I’m scared. I’m not gonna lie With that said, at the end of the day this whole bizarre, extreme experiment that I put my relationship through is such a blessing in disguise. It honestly saved my life. I was really hanging on to my relationship with Evan for a long, long time and fighting for it, but he’s not my person at all. I deserve a lot better, and now that he’s gone and out of my life, I feel such relief, and so free. I’m so excited for the show to be over and for the finale to be done. It’s almost like lifting a band-aid off. I just can’t wait for the next chapter of my life honestly. I don’t know, it’s crazy. For the first time in my life I’m truly genuinely happy, which is insane because six months ago I was heartbroken and depressed and anxiety ridden. 2. Can you tell us what conversations you had with Evan going into this show and what happened at the final Bonfire? That was kind of my mindset going into the bonfire, I was extremely disappointed with his behavior. I was quite honestly disgusted. I was second guessing myself, but thought that I couldn’t break up with him on TV. He has been through enough with his family and his father. So, I went into it knowing I wanted to go home and figure out things at home. Evan basically humiliated me with zero regard, zero respect, and no hesitation at all. It was absolutely unbelievable, and I can’t even really describe what I was feeling because quite honestly it was a total out of body experience. I’ve never experienced anything like that in my life. I totally blacked out. I don’t think they even show this, but I left Evan at the bonfire. I went running down the path. The crew was yelling my name, telling me where to go, chasing me with cameras. I got into the Escalade and I just remember I couldn’t cry because I didn’t understand what was happening. I had a full blown breakdown in the Escalade. It was nuts, I was pulling my choker, I couldn’t breathe. Honestly the fact that Evan did that to me in that way to this day is still shocking. I knew he had issues, and I knew he wasn’t necessarily the best guy, but I didn’t truly realize what he was capable of. Again it’s such a blessing, I don’t have time for that in my life. 3. You seemed to have recognized these signs and had a premonition about Evan. Can you elaborate on that? 4. Evan mentioned that he wasn’t close with your family and only saw them a handful of times. What do you think about this? That was actually Evan’s choice. My family went above and beyond for him and invited him to family vacations, got him Christmas presents, birthday presents, wanted to go on double dates with us. It was always a big deal, and it was always me constantly trying to get Evan to be around my family, but it was uncomfortable like I was walking on eggshells. 5. Why did you stay with Evan if you knew he was not a good guy and why did you need a reality show to determine this? Basically, Evan, he’s really good at saying things are temporary. I would break down and cry about our relationship saying ‘I can’t be with someone who isn’t good to my family and push them away like that. He would tell me ‘I just have demons, it’s not gonna be like this forever, and one day everything is going to be fine. He just knew exactly what to say to reassure me that this was just temporary and just a phase and this is not forever and that he would definitely have a relationship with my family, and when we have children we’d all spend time together at Christmas and at birthdays, and everything would be fine. 6. What are your thoughts on him and Morgan? I don’t know, that’s a whole other thing. I’m not gonna lie I genuinely from the bottom of my heart hope to God for her sake and her family’s sake that it’s real and legitimate and they have a happy ever after marriage and just live healthy and happy forever. I genuinely want that not even for Evan, but for Morgan. No girl or woman ever deserves to go through what I went through. It’ll be Prince Charming for a while and then one day it’ll be a light switch. She’ll start noticing things and get gut feelings, and I just hope to God she listens to it. I think it’s damage control, I really do. There’s a lot of hate and I think he is just trying to prove a point because that’s what Evan does. He is very combative and confrontational, and I think it was one last jab to really hurt me to be honest. 7. Let’s talk about something more positive. Can you tell us about the relationship you built with Val? Do you still talk to him? Val and I are very close. We talk on a day to day basis. I definitely had very strong feelings for him on the show that I was not pursuing because I was loyal and didn’t want to be tempted. The whole reason I went on the show was so Evan could prove himself to me, and that was obviously a failure. I wasn’t there to meet someone and fall in love. I was there for Evan to prove to me that he’s not the same person I met when he was a boy. Looking back, I wish I did pursue things with Val. I definitely wouldn’t have taken it to the extent that Morgan and Evan did because I don’t retaliate in that way at all. I don’t think it’s right. To be honest, I don’t think it’s right for Val; he’s one of the best people I’ve ever met in my life. If me and him were to ever be a thing, I wouldn’t want to start in that type of environment, being on a reality show while my boyfriend is cheating on me. If it’s the real deal, it needs to be started in a much healthier environment. 8. Tell us what life has been like after the show. What have you learned about yourself? I was very blind to the toxic situation I was in for a long time. I finally truly know my worth and know what I deserve, and never again will I be with a man that is anything remotely like Evan. The rose-colored glasses are totally off. He did me a huge favor. I don’t regret the ultimatum I gave him at all. I was stuck, and I was sacrificing my happiness for a person that doesn’t deserve me. That ultimatum and going on the show, everything happens for a reason. I wouldn’t have met Val. I wouldn’t be happy like I am today. I do not walk on eggshells everyday anymore. Temptation Island saved my life. 10. What is next for you? Life is looking bright. I am currently looking at apartments. It is up in the air. I can’t really say where I am looking. I may have some stuff coming up in the entertainment industry, tons of ambassadorships coming up, and making income outside of my 9 to 5 job. I am doing YouTube and I am launching a podcast and I do have my own brand, Bossy that I had to put on hold while I was going through this craziness. So, I am relaunching that. And, I am talking with publishers about writing a book. The book might be a fictional experience about my time on Temptation Island. That will be fun and there will be different characters. 11. You mentioned moving out of your apartment. What was it like when Evan came back? Did you guys have a conversation? When did he leave? Honestly, that story is a complete nightmare. I am going to try to make it as quick as possible. Basically, I got on a plane to LAX and he stayed in Maui for a few days with Morgan. It was my birthday, he flew back on my birthday. He was texting me non-stop, begging and pleading to see me telling me he lost his best friend and partner. He says he doesn’t know what he did. Meanwhile, I am at my apartment with his little brother and his dog. His brother doesn’t know what’s happening. Evan is a mile away at a downtown hotel with Morgan. His little brother had to step in and be like, you have to let him over Kaci. I told Evan he had a week to move out. I told him, I will be at work, you have a week to get your stuff and go. Evan would not move out. He would not do it. So finally, I let him do it. He came over. I let him talk. We talked for 24 hours straight. We didn’t sleep. He was saying he had serious doubts because the show pitted us up against one another and that he doesn’t know what he did and he is doubting his feelings. Then he got on a plane to go to Virginia. As far as I knew, he was going to be back in 10 days. He was going to let Morgan know his doubts and that there was hope for us and that we were going to live separately, and stuff. Then literally three days later, I was sitting at the In and Out Drive Thru with one of our mutual friends and three hours before, he had sent me a “thinking of you” text with a heart emoji. Then while I am at the drive thru, he literally dumped me again in an novel text message. At that point, I cannot even explain what happened. It was like a light switch. It was so emotionally and psychologically insane. Ever since then, he was reaching out to me through text messages, through my friends, threatening to publish my love letters. New Years Day is when I told him, this is how I feel about you. It was a pretty vicious text. I told him that there is no hope for us to be okay so to stop messaging and texting me. And, I haven’t heard from him since. I cannot even explain how disrespectful and uncivil this whole situation was –to me, to my family to his family. It was like out of this world. Everyone is saying that it was a blessing in disguise and that I dodged every bullet in the book. I am not going to lie; October and November I was not okay. And, then right around Thanksgiving, I was like “Boom, lights on” I am good. I don’t miss him. I deserve someone who is good and is going to love and protect me and cherish me. And, someone who is never going to do these things to me ever. He is all I have really known for my adult life. He is really all I have ever known. And it sounds crazy, but I spent three weeks with Val and he is so different than Evan. I felt so strong and sure of myself and confident. The absolute best version of myself. Evan never made me feel that way. The fact that someone I just met was able to make me feel that way, that in itself was a sign. Want to keep up with Kaci? You can follow her on Twitter.